More and more women are reaching their mid-forties without having children. Sometimes this is by choice, and sometimes it's not. But here's what both sets of women have in common: they're operating in a world where being a mother is still considered the default setting for women. Discussions of women in leadership usually assume every woman has to juggle her work with children. But where does that leave the rest of us? In this show we meet three successful women, childless and child-free: Melanie Notkin, founder of Savvy Auntie and author of the book Otherhood, Sara Hinkle, who works in academia and is tired of feeling left out of conversations about work/life balance, and Jennifer Rapach, who has been married for 20 years and has never wanted children. Try explaining that to the rest of the universe. 26 minutes. The book I mentioned at the end of the podcast is Singled Out by Juliet Nicholson. Inspiring and moving. Melanie Notkin is founder and editor of Savvy Auntie. She's the author of Otherhood and Savvy Auntie. Dr. Sara Hinkle works in student affairs at West Chester University in Pennsylvania. She wrote a blog post earlier this year called The Invisible Single Woman. Jennifer Rapach works in politics in Pittsburgh, Pennsylvania and is directing the campaign Tom Wolf for Governor. Pew Social Trends report on childlessness in the US. Professional women, no kids. It’s easy to feel left out of the conversation on women and work. Coming up – three women in their 40s, childless, and child-free on not being society’s default setting. I first interviewed Melanie Notkin for a public radio story four years ago about why marketers ignore single women. She has built a company called Savvy Auntie – it’s an online community for women who like children, but don’t have any of their own. She’s become a bit of a patron saint for women without kids – and there are more of us now than there used to be. In England and Wales, about a fifth of women now end their childbearing years without having had a child. In their mother’s generation, that figure was one in nine women. In the US, it’s slightly lower – about 18 percent of women don’t have children by their mid-forties, when fertility typically runs out. Earlier this year Melanie published a book about the lives of women who always thought they’d have kids, but by their late 30s or 40s, are still childless – basically women like her and me. 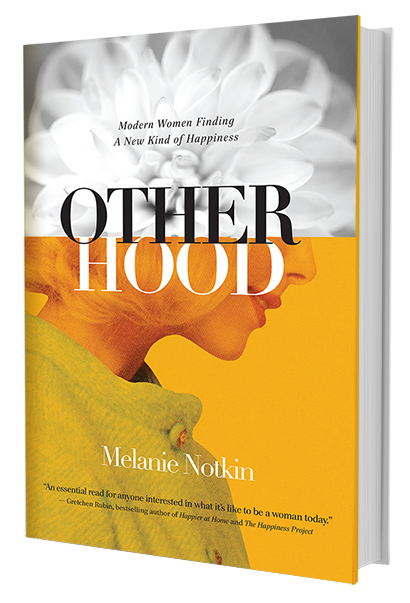 The book is called Otherhood. One common accusation is that you’re too fussy. Or there are the people who tell you to settle – that love and attraction are overrated anyway. Just marry that guy and have his babies while you still can. But Melanie doesn’t buy this. And she doesn’t think other women should have to either. Why do you think this stereotype persists? Because I hear it all the time. Melanie says she talked to another female lawyer for the book. This woman was at a big firm, on track to become a partner. But she wanted to get married and have kids. So in her early 30s she decided to scale back her work life so she could make that happen. She stepped off the partner track and went into the marketing department. She’s now in her late 30s and she still hasn’t found the guy. And she regrets sacrificing quite a bit of heft and income for an idea. I had a vaguely similar story – without the starry ascent or the big money. Years ago, I hedged my bets in one direction: my biological clock was ticking, other people were having babies left and right. I wanted to join them. Not only did I want it for myself, I felt it was what I should do. Not that it would necessarily have done any good. But I wish I’d put fewer eggs in my relationship basket – a relationship that failed – and more in the career basket. I wish I’d paid more attention to what I could manage now. Now it is an option, although the outcome is far from guaranteed. And it’s an expensive option – it can be around $15,000 dollars in a city like New York. Then of course there’s the exhortation by some friends to have a baby on your own. Some women do, of course. But it’s hardly something a single woman supporting herself can take lightly. When you’re single with no kids by a certain age, you can feel like you don’t fit in. That you’re not in this club everyone else belongs to. And as Melanie and I both know, when it’s a club you expected to be part of, it’s hard. There’s a whole mixture of feelings, including isolation. Who’s actually judging us here – is it other people? Or is it us? Melanie Notkin. You can find her at SavvyAuntie.com. That’s how I found her – a friend on Facebook alerted me to her blog post, entitled The Invisible Single Woman. Sara says that’s basically how she feels a lot of the time. She says that stereotype really bugs her – more than bugs her, actually, she finds it insulting. I said to her, what’s always struck me about the popular media view of single women or any woman without kids really, is that it’s so reductive…it’s like women have only one script – and we have to stick to it. But you know what Melanie and I were just talking about – this idea of, do you matter less because you don’t have children? Sara’s thought about that herself. She’s bought into it, in fact, when colleagues have had to leave work early for one reason or another. “It’s sort of this double standard where the parent is applauded and no one bats an eyelash because well of course he or she needs to pick the kid from daycare or go to the baseball game or go to the doctor appointment. But if you’re a childless person, you may be perceived as selfish because you want to go to yoga class, or go meet friends out, or do whatever you’re doing. One of the things that I realized as I was reflecting on this, no one has really made a negative comment to me about it. It’s really my own guilt that I place on myself in that I too think that a parent’s time is more valuable than mine so really it needs to start with me. And I need to respect my time and realize my time is just as precious as anyone else’s. But after I stopped recording, Sara told me something. She said she wasn’t sure whether to mention it earlier because she feels so strongly about women with no kids being left out of these workplace conversations – and how that needs to change. But seven years ago, she froze her eggs. Her baby is due in late October. Yes, there are many women who don’t have children and want them. But there’s also a sizeable minority that has no desire to have children. And if you’re one of those women and you’re married or partnered, that can be tough to explain to an expectant public of friends, family and colleagues. Jennifer Rapach works in politics. Right now she’s the western Pennsylvania political director for the campaign Tom Wolf for Governor. Then there’s the politics of being married and child-free – that’s how Jennifer describes herself. She’s 43 and she’s been married most of her adult life. AM-T: "When did you discuss whether or not to have kids?" And some people do make it their business to give Jennifer a piece of their mind…. “I had a co-worker tell me that I was selfish for not having children. Now this was in a job where I was spending literally 60 to 70 hours a week in a job where I was advocating for working people and the poor. And he’s telling me I’m selfish because I don’t have children. And I kind of threw that back at him and he said, OK, I see your point. It’s not the only time she’s been accused of selfishness. Like the other two women you’ve heard from in this show, she feels the phrase ‘work/life balance’ only applies to people with offspring. Not having kids has allowed her to work the crazy hours a job in politics requires pretty much guilt-free – but there are times she wants to leave at a decent hour, just like her colleagues who are parents. AM-T: "Going back to what you said about work/life balance essentially meaning work/family balance. Do you find that your husband counts as family in other people’s eyes?" True. And I suspect it could take many years – and perhaps some kind of cultural revolution – for those perceptions to shift. Now I’m going to make a recommendation – a few years ago I read a wonderful book called Singled Out – it’s by Juliet Nicholson and it’s about the generation of British women who ended up unexpectedly unmarried because so many men were killed during the First World War. These women were raised to be nothing other than wives and mothers but they built incredibly full lives for themselves – some of them were real pioneers in the world of work. Inspiring stuff. That’s The Broad Experience for this time. I’ll be posting show notes as usual under this episode at The Broad Experience dot com.